When we first moved to Madison, we decided to buy a grill. And we bought a cookbook to go with it. We have since tried many of the recipes and a lot of them have become “favorites.” This is one of them. The recipe comes from the Weber’s Real Grilling cookbook. 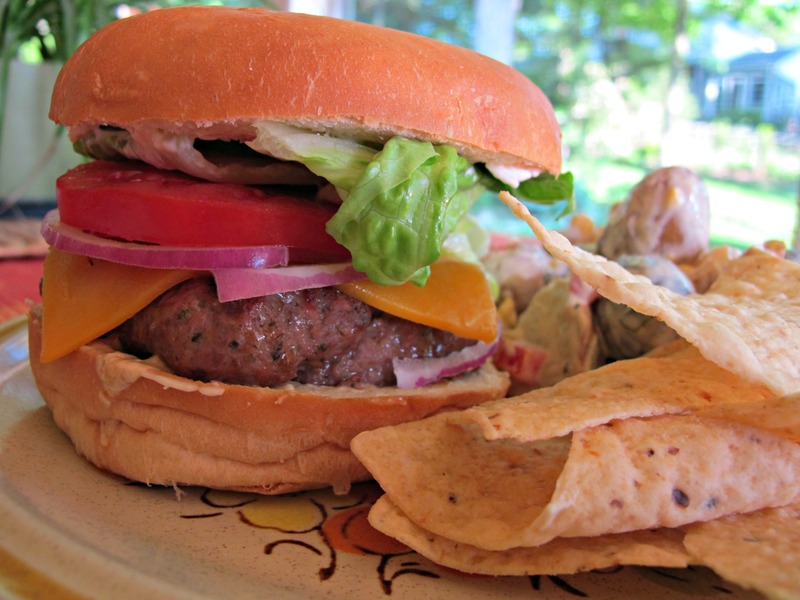 We have made it so many times that it has become our “go-to” burger recipe. And I think that is not only because it is delicious, but because it is so simple to make. And it uses ingredients that most people already have at home. I’ve heard more than a few people say this is the best burger they’ve had. Maybe they were being nice, but they did have more than one burger! As I was going through my files on the computer, I came across a picture of the burger. I am surprised I hadn’t posted the recipe before. So here is a little vintage look at what I was cooking up before I started this blog. I’ve made a few adjustments over the years, but it is still close to the same recipe. And just as good! In a medium bowl, combine the beef, ketchup, basil, thyme, Worcestershire sauce, Tapatío hot sauce, salt and pepper. Mix gently with your hands until combined and divide into four patties. Shape them to about ¾ inch thick and set aside. Grill your patties on high heat until medium, 8 – 10 minutes, turning once. Adjust the grilling time to cook the patties as you like them. When they are cooked as you like them, set them aside for a few minutes before serving. Top each patty with a slice of cheese and place them on the bottom half of the bun and top with red onion, lettuce and tomato along with mayonnaise, mustard, ketchup and pickles, to your taste. Serve while each patty is still warm and enjoy! I agree! The original recipe calls for Tabasco (not the state in Mexico), but I don’t like the flavor. Switched to Tapatío.